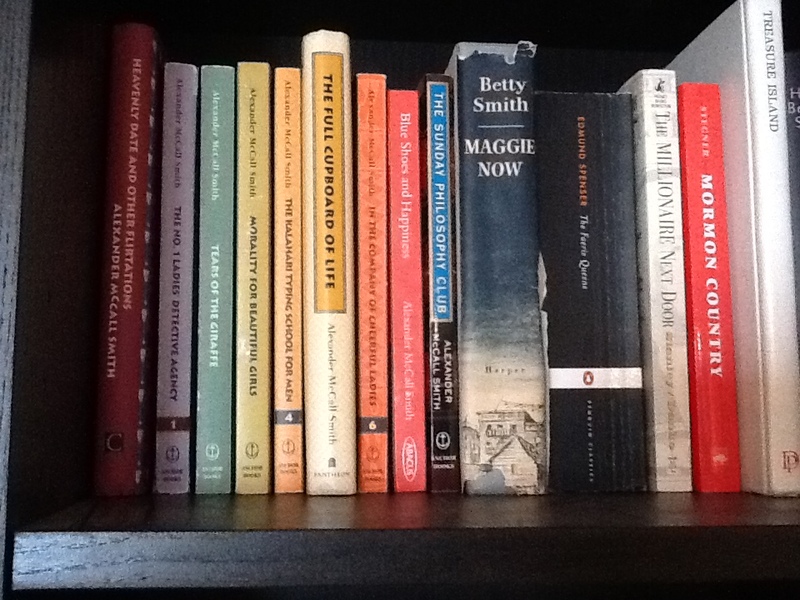 Decorating with Books, Part Two – The Bookshelf of Emily J. Again, I am not a professional when it comes to photography or decorating, but I thought it would be fun to share how I display and store books at my house. If you want to see Part One, click here. Below are some more photos of my shelves. 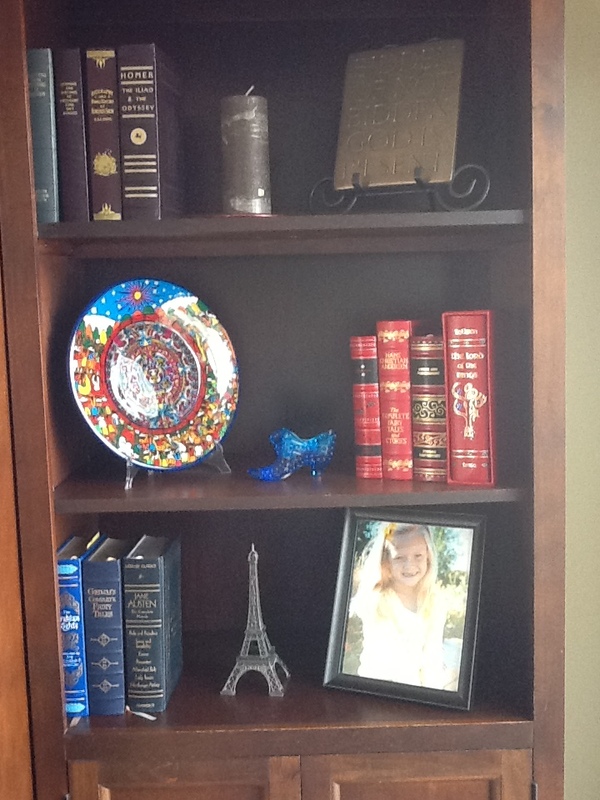 This is a picture of my family room shelves. In the middle is our television, but the sides are what I like the most. They represent who we are, where we’ve been, and what we’ve read. I know the dark wood is so out when it comes to interior design, but it was in when we bought it and I truly love this shelving unit. I like the dark, study- and library-like look, and this accomplishes it. This is a close up of the left side. In the top center is a small vase (the woman’s head) that I inherited from my great grandmother Reba Carmack McMasters who lived in Missouri until she died a few years ago. In the middle is a plate featuring the Delphic Sybil. My dad brought this back from the Sistine chapel for me. 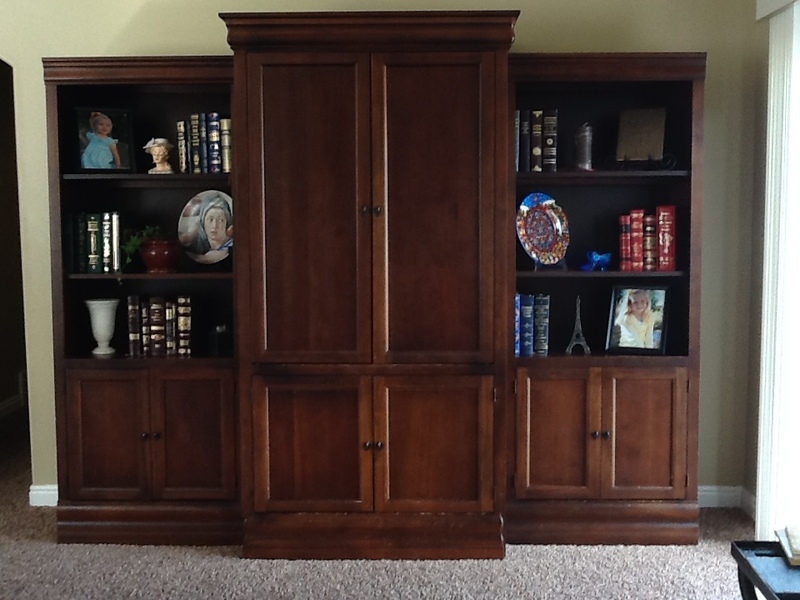 The urn-shaped vase on the bottom shelf is from Restoration Hardware. It is alabaster. This is the right side. The bronze plaque on the top shelf says: “Bidden or Not Bidden, God is Present.” My dad got that for me at Westminster Abbey in London, which I have since had the opportunity to visit myself. The colorful plate in the middle is from Mazatlan, Mexico, where my husband and I vacationed a few years ago. The blue glass shoe next to it is also from my great grandmother. I purchased the replica Eiffel Tower on the lower shelf when we visited Paris in 2008. These are my “messy” bookshelves in our basement. They are the Billy shelves from IKEA. I love them so much. I have generally arranged things alphabetically, but there are sections for my composition and literature books, my CDs (which I know I should just chuck since we have Ipods now! ), my fiction and non-fiction, my family history binders, children’s books, DVDs (which I should also toss since we have Netflix! ), and binders with old school notes and papers. I cannot throw away my old school notebooks and binders. I made that mistake as an undergrad, thinking that I’d never need any of that information again. It was a ritual, to rip apart and throw away my notebooks as soon as the semester ended. I never dreamed then that I would continue my education and eventually teach. And, now that I’m starting a Ph.D. program in August, I feel more than ever the need to hold onto my notes just in case I need them for writing projects or teaching. Did I justify that well enough? Anyway, I make sure to leave plenty of space on these shelves. Nothing is crammed in tight because I am always getting new books or purging the old. This shelf mostly contains books that I plan to read someday, but many of them have already been read and just don’t fit on my plant shelf. I get rid of old books through swap.com, where I trade for books that I’d rather have. It only costs the price of shipping. This is my section which houses all of my Alexander McCall Smith books. 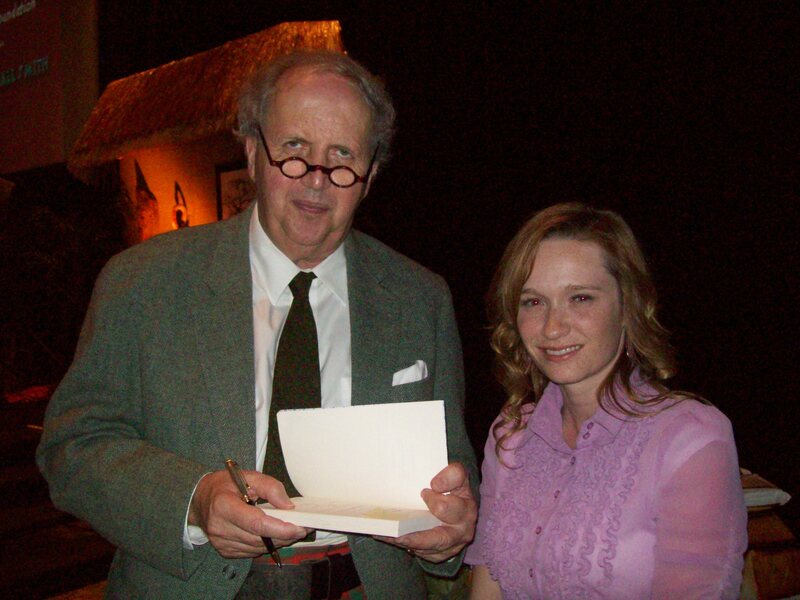 I really admire his work and his delightful tales of Botswana. I met him once at a school foundation dinner where he was the featured guest. He was absolutely charming and hilarious. He had most of us choking on our authentic African dinners, which featured pumpkin and chicken smothered in some sort of raisin sauce. Yum! He signed all of my books for me. Below is a picture of us together. Isn’t he adorable in that kilt? This is my children’s book section. It is a little uneven and wonky right now. My seven-year-old regularly raids it before bed, so things get tossed around and out of order. But that’s okay because that is what this section is for. I remember carefully and lovingly picking out books for this part of my shelf when she was a baby, hoping that somebody she would read and treasure the books as much as I do. And she does. 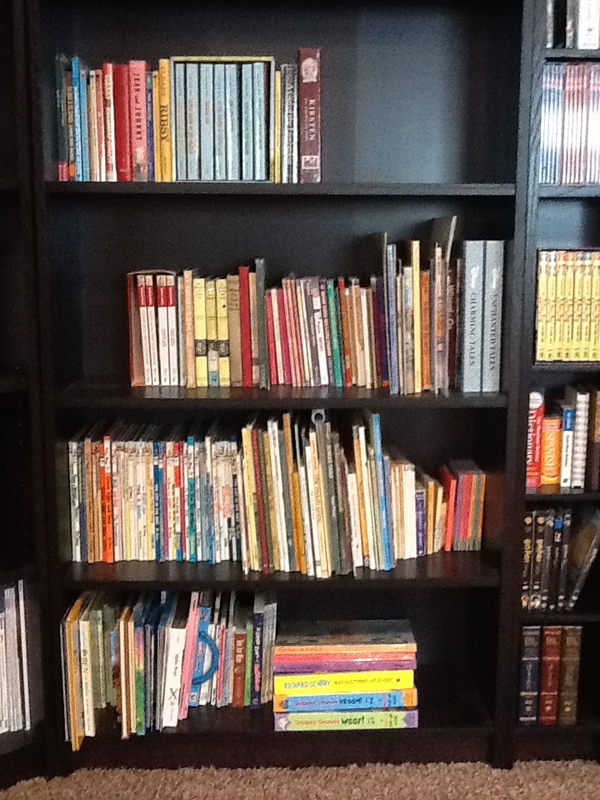 She has her own small Billy shelf in her bedroom in white where she keeps the books she is working on reading. Her top shelf is for chapter books, the middle shelf is for picture books, and the bottom shelf looks like a free-for-all, but I suspect it may be where most of her library books end up. Well, they end up there and all over the floor and under the bed. 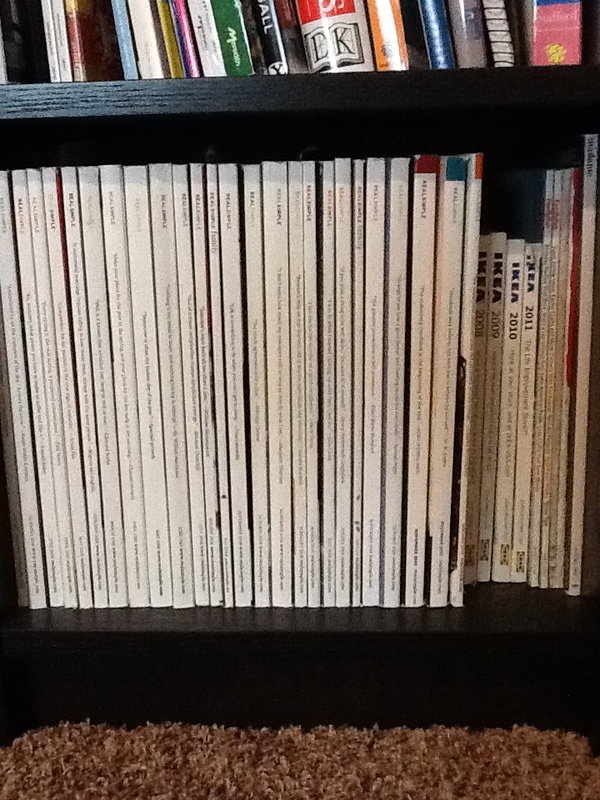 This is my section for old Real Simple magazine issues and my IKEA catalogs. I know they are out of date and old, but the pictures still have fantastic decorating ideas. I just can’t let go. 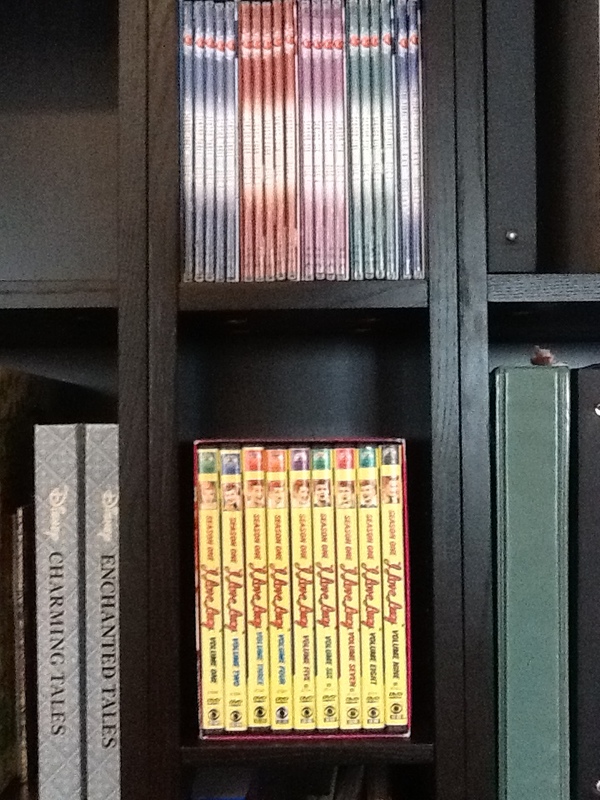 These are my I Love Lucy DVDs. I own every single season. Enough said. 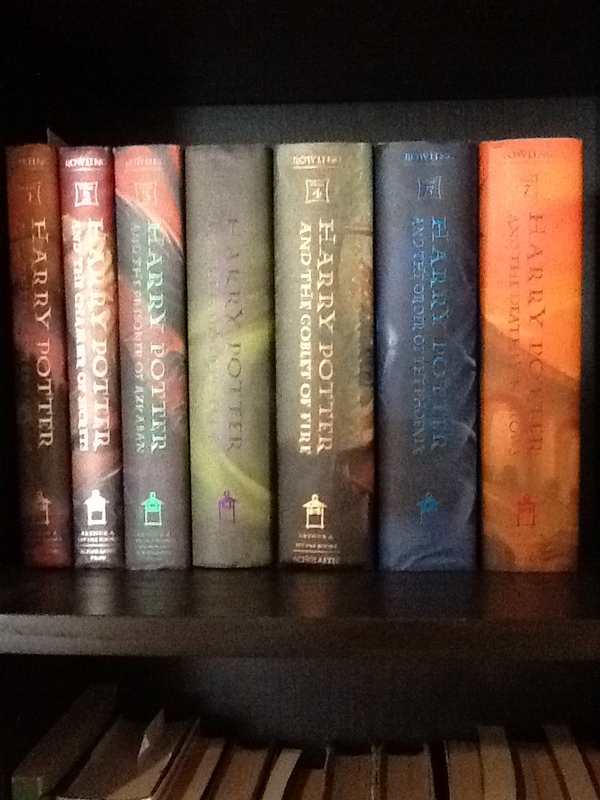 And last, but not least, is a picture of my Harry Potter collection. I keep them on a shelf all their own, for they deserve it. I hope you enjoyed a tour of the books in my house. As soon as I convince my husband to buy more shelves and I then load them up with books, I’ll let you know! Love the book decorating. 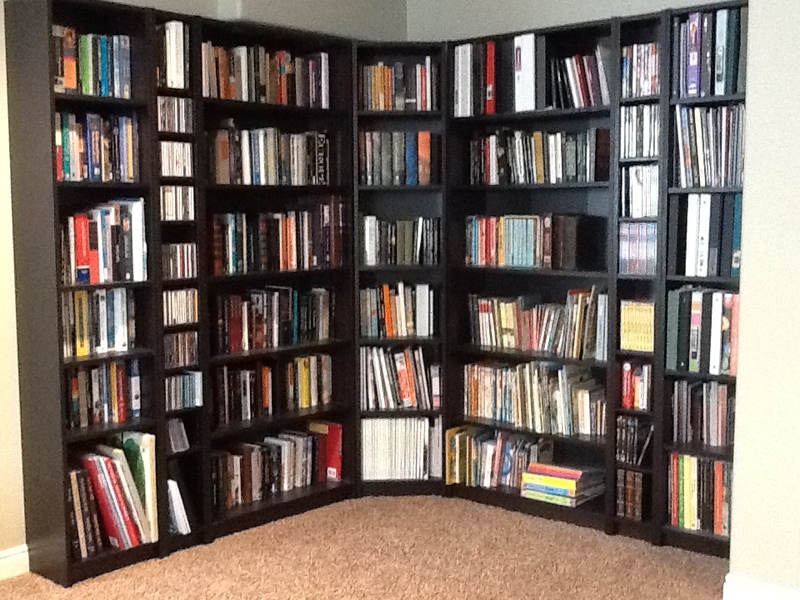 I am excited to buy a house so we can finally un-box our many books and display them all, as you have. 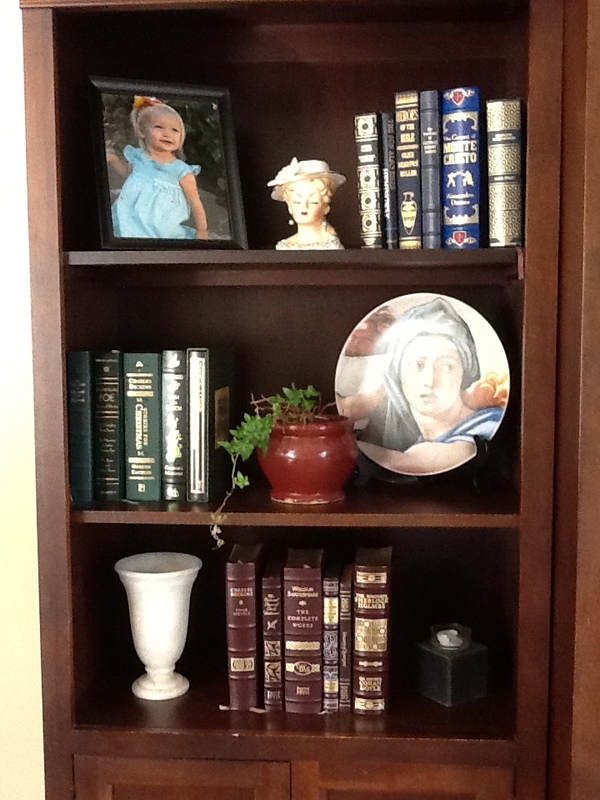 We have a special shelf dedicated to books signed by authors. To date, I have books signed by Carol Lynn Pearson, Jeff Sharlett, Roseanne Barr, Pamela McReady, Rich Benjamin, and Eugene Robinson. I also have a special shelf of book that I think make us look worldly and well read. And I’m not ashamed to admit it. Though I do look forward to having enough space to display both selected works of bell hooks and The Hunger Games trilogy with pride. Do you have a Real Simple Subscription? I was actually thinking of signing you up for one for your birthday… but I won’t if you already have one! This is lovely — armchair book travel! Thanks for sharing your passion and your collection. The next time my husband says I have too many books, I will show him your rooms and shelves because i think you’ve got me beat! By the way, we have the same Billys — color and all — fully-loaded. Cheers! Feel free to use my shelves against your husband! We book lovers need to stick together. I love Billys. They were the first thing we bought when our IKEA opened up. Oh, what fun! I love reading other book lovers’ thoughts and ideas. I am not nearly as well read as you, nor can I hold onto as many because of living in a very small house, but I may just borrow some of your ideas and see how many I can fit in. I’d never heard of Billy shelves, but will have to look into them. I don’t know where I got the idea, maybe it was from an earlier reading from you … or maybe it was an idea in Real Simple … but I amused some of my family and friends by sorting the books on my living room shelves by color. I like them, too. Super neat!Ahhhh just imagine the adventures….Oh jeez i feel like a tiny mouse in the middle of those books……. I love that you call books adventures. So true! This is the third post, of yours I personally read through. I wish for you to have it someday! It’s true! Kids make it hard to find a quiet place to read. I get more reading done when my kids have friends over! Pingback: Books I Received for My Birthday | The Bookshelf of Emily J.